Caroline explains how she battled to gain a treatment for her son’s Plagiocephaly. “I first noticed that Charlie’s head was misshapen when he was just six-weeks-old. His head was really flat on the right hand side. I was anxious about it, as it looked strange. With my partner Steve, we decided to speak to our health visitor about our concerns during Charlie’s eight-week check up. She told us that she was sure nothing was wrong but it was worth going to see our GP to put our minds at rest. So we went to see our local doctor and he told us that there was no need for concern. But we really weren’t happy with this advice. I asked lots of friends and our family what they thought, as Steve and I were aware that as time went on Charlie’s head was becoming increasingly misshapen. We decided to take our baby back to our local GP and insisted that he referred us to a paediatrician. He agreed to refer our case to the Queens Hospital in Romford. Whilst we were waiting for our appointment to be confirmed with the consultant, we spent our evenings trawling the Internet to find out more about the condition. It was here that we discovered about flat head syndrome and read other parents’ stories, which were a great comfort. It reiterated that we weren’t over-protective parents and there really was something wrong with Charlie and there were other babies suffering with the same issues. However, the paediatrician was very dismissive when we met him. In fact he made me feel completely paranoid. He told us that there was no value in putting Charlie in a helmet and that it would be distressing for him. We left the hospital feeling completely deflated, but as we were leaving we saw a lady walk into the unit with a toddler in a helmet. I had to stop and ask her why he had the helmet on. She explained that her baby had a condition called flat head syndrome and strongly advised that we took our own action and did not leave it too late. It was at this point that we decided to make an appointment at the Technology in Motion Clinic in Wimbledon. We’ve never looked back. We saw orthotist Sally Hunt at the Clinic who diagnosed Charlie with severe Plagiocephaly. Charlie had his helmet fitted in January this year and the results have been fantastic. We are going back for our final appointment in three weeks time. 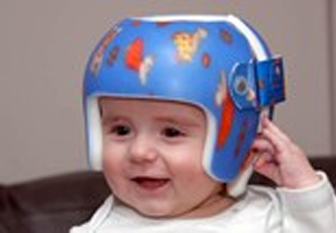 The Cranial Remoulding Helmet orthosis treatment works by creating a pathway for the child’s head to grow to a more symmetrical shape as it develops. The results have been dramatic. We cannot thank the team at Technology in Motion enough for their treatment of Charlie. I am keen to let people know about our plight as it really concerns me that some health professionals are not recognising the condition and, in my opinion, not offering good advice. I can’t help but think that if Charlie was my first baby, I would have been more vulnerable and not so determined to get to the bottom of the condition. There is so much to take in when you are a mum for the first time and you believe what the doctors tell you is gospel.